Normally the first thing I do at Gencon is walk the whole dealer hall just to take in everything that is there, and then decide what games to try out. This time we got in the doors pretty early and found ourselves at the Z-Man booth with an immediate opening, so we decided to jump in on Battle at Kemble’s Cascade. The game is an attempt to emulate retro arcade space shooters, complete with power ups, upgrades, asteroids, energy cells, and dodging enemy shots. Not to mention a massive boss at the end. I say “attempts” but in truth the game is wildly successful at re-creating this feel on the table, and it was a whole lot of fun to play. There were a number of really nifty elements to this game – not the least of which are the plastic trays included to make “scrolling,” a thing I feared would be tedious and game-halting, a smooth and easy process. Each player’s ship comes with a turret weapon which can be rotated, but a number of upgrades are available to trick out, and customize, your ship. My friend blake decided to go for upgraded weapons right off the bat, while I decided to just jump straight into the fray and upgrade my engines and shields a few turns later. I spent our demo flying around and ramming ships (I had a card to gain points for doing so) and shooting down the easiest ships while skirting everything else. The most clever aspect of the game was the damage mechanism. At the end of each round, you calculate a Threat level, based on the number of nearby enemy ships (and enemy ships with ranged weapons who have a shot at you). On your next turn, you can decrease this threat level by moving your ship – thematically dodging enemy ships and weapons. Any remaining Threat near the end of your turn converts to damage. This was an extremely simple way to handle the movement/dodging aspect of these types of games, and it worked extremely well. I felt like I was piloting a little ship around an arcade screen, dodging missiles and taking out enemies. 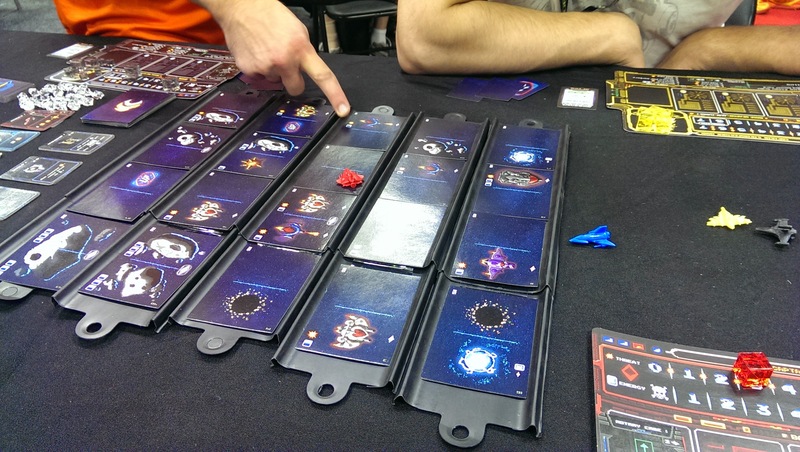 Another clever mechanism was how enemies were handled – enemies and asteroids are printed directly on the map cards, and as a new row scrolls in, new cards are simply dealt out. 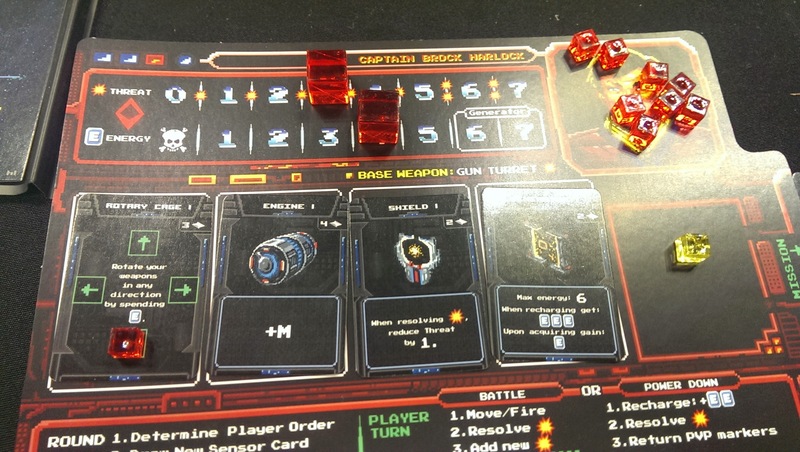 The cards have defense and attack stats right on them – no need to pile up extra tokens or add enemy ships on top of the cards, which reduces a lot of potential clutter. The game includes blank half-sized Space cards which can be used to cover up a destroyed enemy ship when you hit it with the full force of your weapons. Again it just keeps upkeep time to a minimum with less clutter and more focus on the fun of flying your ship around. 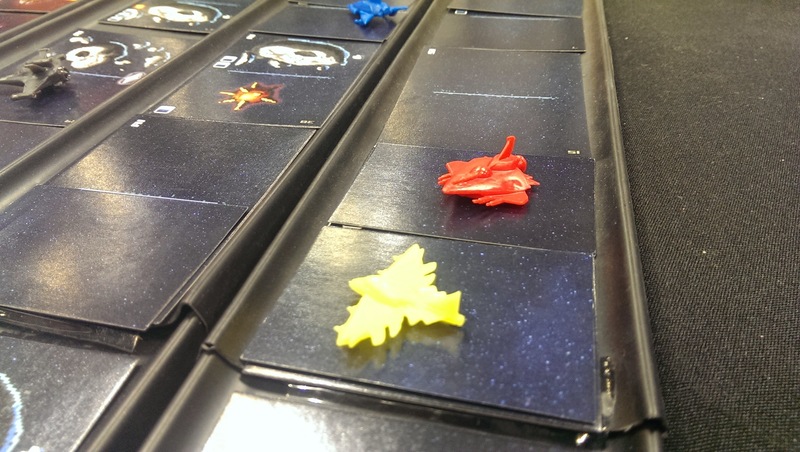 Kemble’s Cascade was one of my favorite games at the con, and it MIGHT just be part of an upcoming iSlaytheDragon giveaway.